Courtney loves playing the guitar, horseback rides and practicing her black belt in karate. And don’t forget giving hugs. At summer camp, when the “hug bell” rings, Courtney joins nearly 100 kids in the center of camp to give free hugs to new friends made during a special week in June. Courtney’s zeal for life is even more impressive in light of the obstacles she’s already faced as a 14-year-old. When Courtney was born in 2003, her mom knew something wasn’t right. Courtney was later diagnosed with a spontaneous condition called an RYR1 myopathy, a neuromuscular disease affecting muscle movement and strength. She can’t run, she has to monitor her body temperature and she faces spine surgeries and therapies to maintain her health. Yet, Courtney has found a place where they understand. “Camp Sunshine is home,” says Courtney. 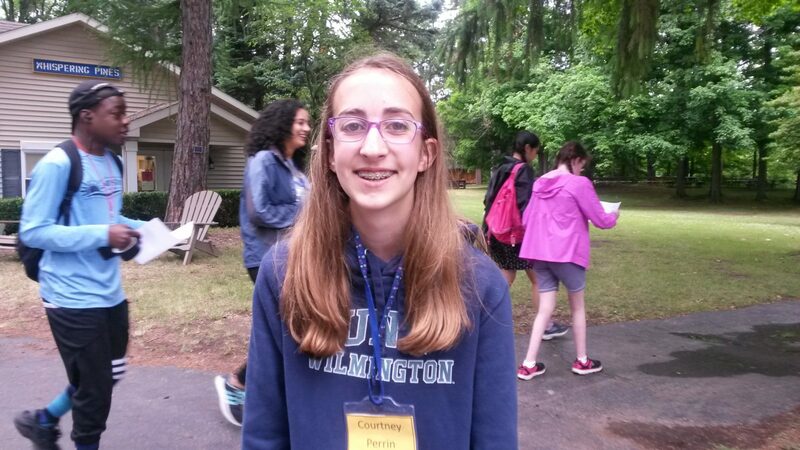 “People don’t judge you because they have muscular diseases too.” For one week every year, Courtney attends Camp Sunshine, the Muscular Dystrophy Association’s annual retreat in upstate New York for kids ages 8-17 facing a neuromuscular disease. Courtney describes camp as a place with endless fun, where she can write songs with pals, get glammed up for the Camp dance and make friendship bracelets for hours. The Joy in Childhood Foundation is proud to fund Camp Sunshine and help kids like Courtney make lifelong friends and memories.